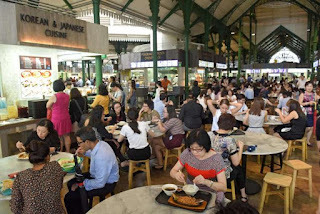 The average Singaporean today is heavier, more likely to overeat and - unsurprisingly - tends to put on weight once he enters the workforce. This is especially so among men, who typically put on 4kg within the first decade of starting work, new data from the Health Promotion Board (HPB) shows. The data was part of an HPB study of more than 60,000 people gathered over nearly 30 years to learn more about obesity trends here. Between 2011 and last year, researchers found that obesity rates generally stayed between 10 and 15 per cent for both genders during the school years - that is, for children aged between five and 18. However, the proportion of overweight people in each age bracket began to grow starting from age 21, when many people start full-time work. Last year, 42 per cent of men aged between 30 and 39 were obese, as were 28 per cent of women. Overall, the average Singaporean is 3kg heavier than his counterpart from 15 years ago, said Dr Annie Ling, who is director of HPB's policy, research and surveillance division. And while people have become slightly more active in recent years, they are consuming more calories. Worse still, the proportion of those who exceed their recommended daily calorie intake has grown - from 34 per cent in 1998 to 59 per cent in 2010. Dr Melvin Look, a general surgeon from Mount Elizabeth Hospital, said: "A 3kg increase in average weight over the last 15 years may not seem much, but it is a worrisome trend." Dr Look, who specialises in gastrointestinal and advanced laparoscopic surgery, added: "It is enough to push a large number of people from normal weight to overweight and, more significantly, put many overweight people in the obese range." According to a recent report from the Economist Intelligence Unit, obesity is estimated to have cost Singapore up to $2.77 billion last year in terms of healthcare cost and lost productivity. People who are obese have a higher risk of developing health problems such as diabetes and heart disease. These can, in turn, lead to complications such as stroke and organ failure. Said Dr Ling: "Adult obesity is extremely difficult to reverse - I think that has been well documented in the (medical) literature. "I think we should really intervene as early as possible... we probably even need to go into the pre-school setting." Civil servant Jonathan Lim, 29, said it has been hard to stick to a regular exercise schedule since he started work four years ago. He estimates he has put on about 5kg in the last two years. "I work 12 to 13 hours daily, and I'm often too tired to exercise after work," he said.